When guests arrive, God arrives! We are seekers, believers, doubters, and dreamers who gather each week to celebrate God's love and presence in our midst. We are married, partnered, single, gay and straight; we are families at all ages and stages of life. We are theologically progressive, liturgically somewhat traditional, and politically diverse - and we welcome all. We come from Lutheran, Catholic, Baptist, Unitarian and many other faith traditions - and from no tradition at all. In Poland, where many of our original and current parishioners came from, they say "When guests arrive, God arrives." This is the rule by which we strive to live as a growing Catholic parish community with open doors and minds. We cherish our Polish roots, while celebrating diversity of all who enter. All really are welcome at St. Stanislaus and all are needed to spread the Good News of God's unconditional love. On this website you can find out what is happening in our Parish in coming days and weeks, familiarize yourself with our story, read our Parish bulletin, watch recent Sunday homilies or read Fr. Marek's most recent monthly reflection. Make yourself at home, and come back often! We proudly profess Catholic faith and celebrate Catholic sacraments, but we are no longer a part of the Archdiocese of St. Louis, nor do we belong to the institutional Roman Catholic Church. On March 15, 2012 Judge Bryan L. Hettenbach issued a ruling in which he affirmed St. Stanislaus' ownership of its property and confirmed its right to self-determination. On February 13, 2013 the Archdiocese of St. Louis and St. Stanislaus issued a joint press release in which a settlement was announced that ended, once and for all, legal disputes between these two parties. Our church and grounds are owned by the parishioners and we do not receive any funds from any source other than through individual donations and fundraisers. Consider supporting our Parish and its many ministries - all donations are tax deductible to the full extent allowed by law. On Holy Saturday, April 20th, the Blessing of Easter Food will be offered in our church at four different times: 11:00 a.m., 1:00 p.m., 4:00 p.m. and 6:15 p.m. This tradition called Święconka is one of the most enduring and beloved Polish traditions - please help us to cultivate it, encourage your neighbors and friends to join us! If you need any guidance on how to prepare your Easter basket in accordance with the old, Polish traditions, special flyers with instructions can be found next to the bulletins. On Saturday, May 4th, we would like to work together on beautifying our campus, especially its green areas. Our church and hall are very pretty inside - let's make sure that the "curb appeal" matches the inner beauty of St. Stanislaus! Please join us at 9:00 am and plan to stay until 12 Noon. If you can, bring your rakes, wheel barrels, garden gloves, ad spades.Come early for coffee and donuts, stay til noon for hot dogs and chips. "With Many Hands The Burden Is Light!" St. Stanislaus Pride Committee is inviting everyone to their "Cinco de Mayo" Celebration on Sunday, May 5th from 10:15am until 1:00pm. Please join us for some finger-licking, authentic Mexican foods and lots of delicious margaritas! All the monies raised during this event will help us cover the cost of participating in St. Louis Pride Festival and Parade. Parishioners, as well as anyone in need of spiritual or sacramental assistance, may request Father Marek Bozek's or Mother Annie Watson's ministry for spiritual counseling, sacramental preparation and celebrations. At St. Stanislaus we also offer a wide range of educational and social activities. We strive to make this faith community a place where all disenfranchised and excluded persons can find their spiritual home. Sunday Mass (Eucharist) is offered at three different times: Saturday 4:00 PM (English), Sunday 9:00 AM (English) and 11:00 AM (Polish). All are welcome at our Eucharistic table and Holy Communion is never denied to anyone! Bible Study convenes every Wednesday at 10am and 6pm. It is based on the Lectionary Scripture selections read on Sunday Mass. This Bible Study helps make the Scriptures easier to understand, explain historical and cultural background and encourage the participants to apply these Scriptures to their daily lives. Sunday School or Parish School of Religion is a program through which our young members grow in knowledge and love of Jesus Christ. Its meetings take place every other Sunday at 10:15 AM September through May. Sacrament of Reconciliation (Confession) is available every Saturday from 3:00 until 3:45 PM or by appointment. Communal Penance Service with General Absolution is celebrated twice a year - before Easter and Christmas. Food Pantry offers the less fortunate members of our neighborhood non-perishable food items, fresh produce, and personal hygiene items. It is open every Friday from 10am until 12 Noon. Free Hot Lunch (Soup Kitchen) every fourth Tuesday of the month, from 12:00 to 1:30 pm, we are serving a free hot lunch to anyone who cares to drop by. We could use your help, either your labor or your financial support. If you have time, we meet at 11:00 am to prepare food for our guests. Polish Language Classes for Adults. In addition to basic conversational skills we are also studying Polish customs, songs, and prayers. Anointing of the Sick is offered communally twice a year and individually by request, either at home or any healthcare institution. Baptism of Infants and Adults is celebrated as a joyful event and is a testimony to the growth of our community. Funeral Mass or Service is always a celebration of life of the deceased person. It is never denied. Weddings, and Marriage Preparation, are offered to all couples on as needed basis. 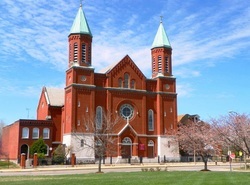 We are honored to be one of the most popular wedding churches in St. Louis Metropolitan area. No matter how many times you have been told by your priest or minister that you don't belong in the Church - it simply is not true! God's love is much bigger than man made limitations and there is plenty of room for you in God's Family! Should you wish to discuss your spiritual journey with our pastor, schedule sacramental celebration, or just chat with someone who will not judge you - send us a message and we will get back with you at the earliest convenience.